Obviously, because these objects are actually six-dimensional, any pictures we make of them are just projections, because we cannot visualise a shape with any more than three dimensions. 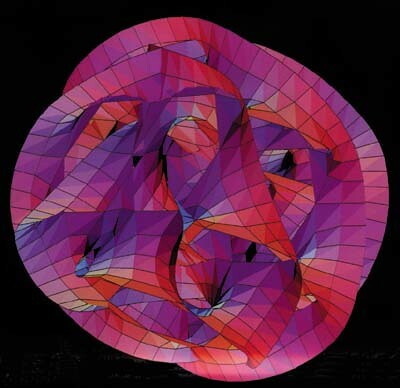 So these images here are best thought of as “shadows” of the real Calabi-Yau manifolds. “Higher dimensions? What a load of rubbish.” Although we can’t visualise or see anything that has more than three dimensions, higher dimensional objects are easy to write down in mathematics and play with. In relativity theory all the quantities you deal with are 4-vectors, which are objects embedded in a four dimensional spacetime. It’s not crazy then to think about four dimensional objects, even if we can’t visualise them. In fact it’s commonplace in modern physics. The more controversial point is whether there are any more than four dimensions. This is one of the main features of String Theory; it proposes that we actually live in a world with 10, not 4, dimensions (nine spatial dimensions and one temporal dimension). Where are all these extra dimensions? Surely if there were six more spatial dimensions we would notice them? Yes and no. Sure, if there were six extra-huge spatial dimensions we would be able to move through them and our world would be an extremely different place. If these dimensions are curled up however, compactified into a tiny, tiny size then we wouldn’t notice their presence. The best way to think about this is to imagine an ant on a piece of string with a really tiny radius. The string just looks like a one-dimensional length to the ant, but in actual fact the space the ant lives on is three-dimensional, two of the dimensions have been compactified. We don’t hypothesise that there are six extra spatial dimensions because we think it’s a funky idea. If string theorists could find a model with only the usual four dimensions they would jump on it. The problem is that in order to reproduce the standard model of physics and the properties of all the particles in it, there is no viable four-dimensional model. Different compactifications of extra dimensions gives rise to different numbers and properties of particles. The reason why the Calabi Yau manifolds are so special is because it is only when we compactify space into a Calabi Yau manifold do we reproduce the standard model of physics. This seems to suggest something very deep about the relation between nature and these strange six dimensional shapes. The other reason that Calabi Yau manifolds are necessary in string theory is because they have a property called Ricci-flatness. This essentially means that the Calabi-Yau manifolds are solutions to Einstein’s equations of General Relativity in a vacuum. In other words, Calabi Yau manifolds are one of the few shapes that space can consistently be in the absence of matter.